Drs. Samuel Pearl and Alexander Ereso of Pearl-Ereso Plastic Surgery Center are pleased to announce a new non-surgical treatment for a double chin. Kybella is an injectable product that dissolves fat in the submental region (underneath the chin). Approved by the FDA for safety, Kybella is a relatively comfortable and easy way to improve the appearance of the chin and upper neck. If you are concerned about the contours of your chin and jawline, the doctors invite you to schedule an informational consultation. There are a few reasons why you may have a fatty or poorly defined chin. You might be overweight (and working to get back in shape). You may have succumbed to the aging process. Or, you may be the victim of genetics. If your mother or father had a double chin, you may be more likely to resemble them in that way. Regardless of the reason why you look the way you do, Drs. Pearl and Ereso can help reduce your double chin and restore a beautiful contour to the area. And the best part is, the solution does not require incisions, anesthesia or stitches. Prior to beginning treatment, the doctor will make tiny marks underneath the chin where Kybella should be injected. A topical numbing agent will be applied to the area to be treated. 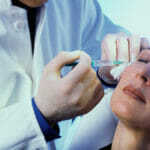 Then, the doctor will inject small amounts of the product under the skin using a thin needle. The acid breaks down and destroys the unwanted fat cells to create a slimmer and more contoured appearance. The number of injections depends on the size of the treatment area and amount of excess fat. The entire process is very quick, and you will be in and out of the office in less than an hour. The treated area may look temporarily red, swollen or irritated, but this won’t last very long. You can resume work and exercise after a day or two. Depending on the individual patient and the amount of excess fat, it can take up to three or four visits to achieve the desired results. Once the fat is gone, it does not come back. Also, there is no scarring in the area. Kybella patients can enjoy their results for years to come, as long as they maintain their current weight. Drs. Pearl and Ereso have seen incredible transformations, thanks to Kybella, and our patients love it. Without a double chin, the face looks leaner, healthier and more youthful. Schedule an appointment to discuss Kybella in detail with our plastic surgeons. If you are interested, we can discuss other non-surgical facial rejuvenation treatments during consultation. Contact Pearl-Ereso Plastic Surgery Center by calling (650) 964-6600 today.